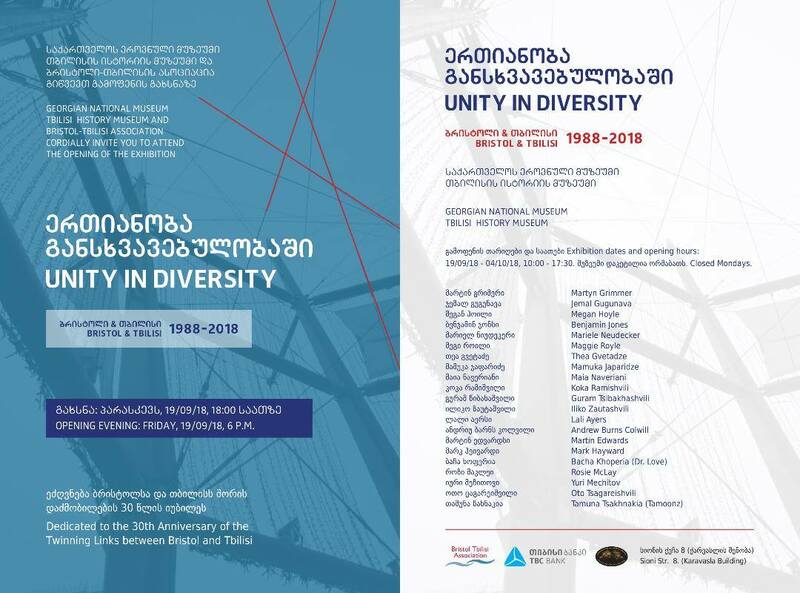 Georgian National Museum presents the exhibition "Unity in Diversity. Bristol & Tbilisi: 1988 -2018" in Tbilisi History Museum. The exhibition is dedicated to the 30th Anniversary of twinning and friendship of Bristol (United Kingdom) and Tbilisi. Twinning started as a movement after the Second World War as way for people from different countries and cultures to become friends and gain a greater understanding of each other. Bristol and Tbilisi were twinned in 1988 when Georgia was still part of the Soviet Union. The exhibition will bring together Georgian and British artists, who participated in different art exhibitions and festivals in Tbilisi and Bristol during 30 years, as well as other internationally recognized artists and emerging talent from both cities. Among artists are: Martyn Grimmer, Jemal Gugunava, Megan Hoyle, Benjamin Jones, Mariele Neudecker, Maggie Royle, Thea Gvetadze, Mamuka Japaridze, Maia Naveriani, Koka Ramishvili, Guram Tsibakhashvili, Iliko Zautashvili, Lali Ayers, Andrew Burns Colwill, Martin Edwards, Mark Haywand, Bacha Khoperia (Dr. Love), Rosie McLay, Yuri Mechitov, Oto Tsagareishvili, Tamuna Tsakhnakia (Tamoonz). The "historical" part of the exhibition will include photographs and prints from different Bristol-Tbilisi Twinning Association projects and Bristol and Tbilisi landscape images which will give viewers images of the beautiful places they live. Coincidently this exhibition takes place at the same venue in Tbilisi where the first young Georgian and British artists' group art exhibition "Silk Road" was held in 1994. Curated by British artists Bruce Allan and Anthea Nicholson. The idea behind this exhibition is to celebrate friendship, international connection, cultural diversity, self-expression, innovation and traditions by invoking the concept of "unity without uniformity and diversity without fragmentation". The exhibition explores ways to unlock the potential in the combination of very heterogeneous artworks composed from different media and materials, including photographs, video installation, sculptures and painting, and aims to find new insights by bringing the diverse work of disparate artists together showing how we are similar rather than how we are different. The exhibition is organized by the Georgian National Museum and The Bristol-Tbilisi Assosiation and is supported by TBC Bank.